Armistice Day. Every year on the 11th hour, of the 11th day of the 11th month, people from all over the world join in a moment of silence. We honour those who fought for freedom and justice and reflect upon the horrors of war, remembering all who made the ultimate sacrifice. Poppies, the first flowers to rise from the churned-up earth atop of soldiers' freshly dug graves, or so the stories go, led to them becoming an iconic symbol of remembrance. In the UK, the "Poppy Appeal" supports the Royal British Legion, a charity that focuses on the remembrance of the past and provides support for the present and future veterans of wars involving British and Commonwealth troops. Obviously, it is important to remember past wars and simultaneously honour those who died, so why would anyone not wear a poppy? Being overtly pro-peace and/or anti-war. You don’t need to understand the full complexities of warfare to understand that the outcome has very few benefits, to very few people. It’s easy to look at modern war, for instance the “War on Terror”, and feel like it is fabricated, aggressive, unjustifiable and avoidable. It’s easy to feel like peace SHOULD be the only option. At this time of year, we are bombarded with images of poppies and soldiers. For anyone who is pro-peace, it can feel like we haven’t learned from the atrocities of the past at all. Every year, rightly or wrongly, the poppy is percieved to more heaviliy reinforce as a symbol of war, rather than a symbol of remembrance. For this reason people choose to boycott it, providing a voice for those who are pro-peace and/or anti-war. In one line: What is the point in remembering, if we forget and continue with acts of war? Buying and wearing White Poppy for Peace from the Peace Pledge Union. The white poppy was created just 12 years after the red poppy. It is often seen to be a symbol of the “never again” attitude and serves as a symbol of remembrance, while supporting peacebuilding. Voting! Use your voting voice and support a party whose foreign policies align with your values on war. Whether a person is for or against war is beside the point here. The fact of the matter is, we are at war. But, where does the money to fund war come from? If our taxes can afford to pay for war, then our taxes should also pay for the aftermath. Our government/s should provide the support veterans and veteran families need to live fulfilling lives. This includes; employment opportunities, rehabilitation, therapy and decent welfare. Instead, in the UK at least, we see budget cuts to major health organiations and veterans relying on food banks and forced into homelessness. In the wake of the current governments' shirking of responsibilities, British Legion, and similar non-profit organisations, provide much needed support to veterans and their families. However, our leaders and decision makers need to be held accountable for their actions. We need to question where our taxes are being spent, why government omits responsibility for veterans, and why our government can’t afford to properly support those who suffer the fall-out of war. Many believe that the poppy has become a political symbol, used by government to justify their actions. 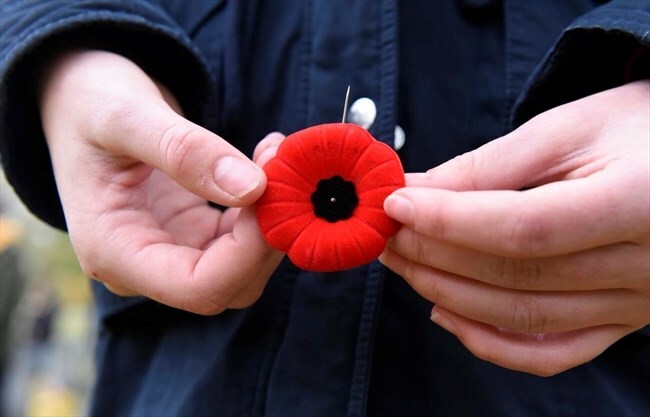 In buying a poppy, it sends a message to the government that we, the tax payer, are prepared to pay twice; once through taxes, once through donations. Our actions, in wearing or refusing a poppy, tell the government that these political and monetary actions are either; supported and welcomed, or opposed and condemned. In one line: Why does the government not adequately support veterans and their families? Write a letter to your local MP, especially if you have homeless or struggling veterans/veteran families living in your area. Your letter will help with the recognition of veteran social issues and place pressure on the government to accept full responsibility for the welfare of veterans. Vote! Again, use your voting power to vote for a party that will commit to providing more support for veterans. Give your time and provide practical and/or emotional support. This could be through charities, such as Blind Veterans or British Legion, or by taking proactive steps within your community. If you know of veterans, veteran families or homeless veterans living in your area, approach them, and ask if there is anything they need. Sometimes a friendly face makes all the difference. As well as those who don’t believe in donning a poppy, there are those who believe that everyone must wear one. This attitude has led to, particularly in the media; pressure, bullying and slander, directed to those who aren’t wearing a poppy (even if they haven’t vocalized why they aren’t wearing one). If you want evidence that this is happening, look no further than the tabloids, who vilify celebrities and politicians seen not wearing poppies, every year. In fact, this very action is evidence that the poppy has become a political symbol. Think back to the “news” story of Jeremy Corbyn not wearing a poppy - a smear campaign designed to turn people away from labour values. "the decision to wear it must be a matter of personal choice. If the poppy became compulsory it would lose its meaning and significance. We are thankful for every poppy worn, but we never insist upon it, to do so would be contrary to the spirit of Remembrance and all that the poppy stands for." - Statement from the Royal British Legion. In one line: Hate speech towards people who choose not to wear a poppy, for whatever reason, devalues the symbolism of the poppy. Forgetting everyone else's opinions and remember in your own way. Take a chunk of time out of your days to genuinely reflect and remember. Read war poetry or short stories, watch videos and documentaries, or simply appreciate the luxuries and comforts you have. If you've found a story or message that resonates with you, that strikes a chord about remembrance, share it with others. Recognising those you currently serve. Send a care package or letter to a serving solider away from home with Support our Soldiers. Hiring veterans. If you are in a position of power in the work place, take active steps to help veterans transition into the workplace. We ALWAYS have a choice; to wear a poppy or not to. People sit on both sides of the fence about this issue. BOTH SIDES are entitled to their opinion. Many will see this post as un-patriotic. However, by definition, to be patriotic is to have or express devotion and support for one’s country. Being British is a privilege and its citizens and residents are blessed to be a part of it. However, being patriotic should not mean we have to blindly accept the decisions and actions that surround us, particularly those from government. Without scorn or judgement, we should be able to support and love our country by freely and openly questioning and opposing, in order to make our country better for EVERYONE who is part of it.